Did Venus Once Have Oceans of Liquid Carbon Dioxide? A new study suggests that it is possible that the planet's past included strange bodies of liquid carbon dioxide. Venus is a hot hellscape that make it difficult to imagine it ever being covered in the water that may have been in its atmosphere — the water probably could not have cooled down enough to turn into rain. So now researchers think it's possible that the oceans that once flowed on Venus were composed of liquid carbon dioxide. To see what the effects of supercritical carbon dioxide on Venus might be, [Dima] Bolmatov and his colleagues investigated the unusual properties of supercritical matter. A great deal remains uncertain about such substances, he said. Scientists had generally thought the physical properties of supercritical fluids changed gradually with pressure and temperature. However, in computer simulations of molecular activity, Bolmatov and his colleagues found that supercritical matter could shift dramatically from gaslike to liquidlike properties. 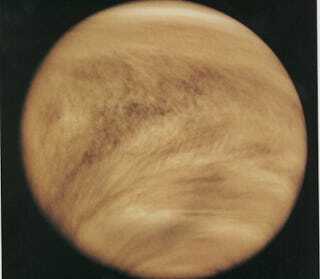 The atmospheric pressure on the surface of Venus is currently more than 90 times that of Earth, but in the early days of the planet, Venus' surface pressure could have been dozens of times greater. This could have lasted over a relatively long time period of 100 million to 200 million years. Under such conditions, supercritical carbon dioxide with liquidlike behavior might have formed, Bolmatov said. "This in turn makes it plausible that geological features on Venus like rift valleys, riverlike beds, and plains are the fingerprints of near-surface activity of liquidlike supercritical carbon dioxide," Bolmatov told Space.com.